As a newlywed in the mid seventies I owned a small book of braised meat dishes from around the world. 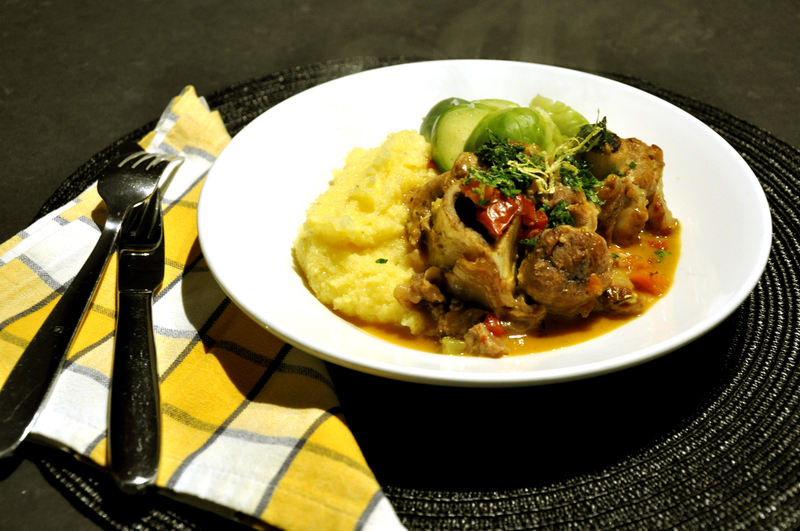 That book is long gone, but my love of osso bucco first made from that little book has not. I love the stickiness that the veal shin contributes to the light yet rich sauce, I love the sweet soft meat so tender you could eat it with a spoon and I love the sharp freshness the gremolata imparts to finished dish. Heat 1 tablespoon of oil in an ovenproof dish with a lid. Sauté the carrot and celery until soft. Toss the pieces of veal shin in the seasoned flour, then heat 1 tablespoon of oil in a separate pan and brown the veal. Add the meat to the vegetable pan, then deglaze the browning pan with the wine, scraping all the meat residue into the liquid. Pour the wine over the meat and veg then add the tomatoes, sliced garlic, bay leaves, thyme and lemon rind. Pour over sufficient stock to cover the meat. Bring to the boil, lay a piece of baking paper over the surface, cover and place in the oven for 1 1/2 – 2 hours or until the meat is falling off the bone. Best the chill overnight, the flavours will develop. Lift any solidified fat from the surface before reheating to serve. This entry was posted on June 28, 2012 by ladyredspecs in Food, Gluten Free, Main Meals, Pork and veal and tagged braised, veal shin.